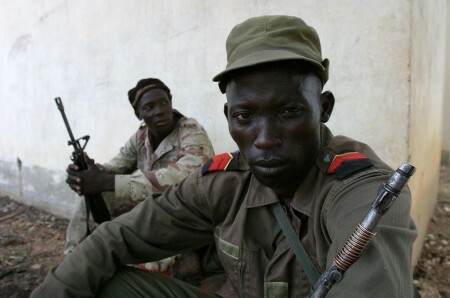 In 2004, CAR authorities indicted both Patassé and Bemba for gross human rights violations during the armed rebellion. By then Bemba was a vice president in the Congolese government, enjoying immunity from prosecution in domestic courts. That same year, having failed to arrest the two men, CAR referred the situation to the ICC. In April 2006, CAR’s Supreme Court found that the national judicial system was not capable of dealing with international crimes. On the basis of this decision, the ICC prosecutor began formal investigations in 2007. This was consistent with provisions in the ICC’s Rome Statute that it should only intervene if and when a state is unable or unwilling to do so. Facing potential charges of high treason in the DRC following clashes between his military guard and the Congolese army, Bemba fled to Europe in 2007. In May 2008, the ICC issued a warrant for his arrest, which Belgian authorities immediately acted upon. The following month he was transferred to the ICC. This is significant. For the first time, the ICC has found a commander guilty for the conduct of his troops even though he was neither directly engaged nor physically present in the conflict. The ICC’s ruling reinforces the international law concept of ‘command responsibility’. The message is clear that commanders can be held accountable for crimes committed by their troops even if the commanders did not order the crimes to be committed, and if they failed to take adequate measures to prevent such crimes being committed. Bemba was convicted not only for actively commanding his troops, but also for failing to control them or prevent them from committing crimes which, the ICC judgment stated, he was well aware of. A precedent has been set that should be heeded by anyone taking up arms anywhere in the world today, including heads of state. Bemba’s case is also significant as the first at the ICC to focus on sexual violence as a weapon of war. According to the international human rights NGO, the Fédération Internationale des droits de l’Homme (FIDH), Bemba’s trial sheds light on the ‘destructive effect that the use of sexual violence as a systematic weapon of war’ has on victims. Reactions to the conviction will undoubtedly be mixed. In the DRC the sentiment not only among Bemba’s supporters, but also the public at large, is that the charges against him and his arrest were a political ploy to eliminate him as Kabila’s main political opponent. Bemba had a strong following in the DRC and came close to winning the presidency in 2006, when he and Kabila entered a run-off. Kabila won that election, while Bemba’s MLC won 64 seats in parliament – more than any other opposition party. The MLC has since been weakened – especially with its leader facing trial at the ICC. A rift within the movement has also damaged the MLC and in 2014, then secretary-general Thomas Luhaka and two other senior members joined the Kabila government. Nevertheless, Bemba remains an iconic figure in the DRC. With Kabila’s decline in popularity, many felt that Bemba was a viable presidential candidate. The current uncertainty caused by Kabila’s refusal to declare that he is not running in this year’s presidential election, coupled with an orchestrated delay in the electoral calendar, have fueled opposition to the ruling alliance. Last week Vital Kamerhe, the leader of the opposition Union pour la Nation Congolaise (UNC – Union for the Congolese Nation), visited Bemba in The Hague. Kamerhe is a former member of the ruling party and was president of the Congolese National Assembly from 2006 until 2009 before he was unceremoniously booted for criticising the government’s decision to allow Rwandan troops into the DRC. Monday’s guilty verdict dampens the spirits of those who thought Bemba would be exonerated and could return to the Congolese political scene. Across the border in the CAR, sentiments are a little different. Bemba’s ICC trial has been somewhat eclipsed by the violence and political disintegration of the last four years. Nevertheless, human rights and victims rights groups have lauded this landmark conviction. For them, justice has been done. One cannot ignore that this landmark ruling comes at a time when the ICC is fighting to maintain legitimacy with African leaders. They will undoubtedly take note that the court has now convicted a former vice president. And should the Kabila camp in DRC celebrate Bemba’s conviction as a victory, they would do well to consider the precedent that the verdict sets – the ICC’s firm pronouncement on command responsibility could come back to bite them too.